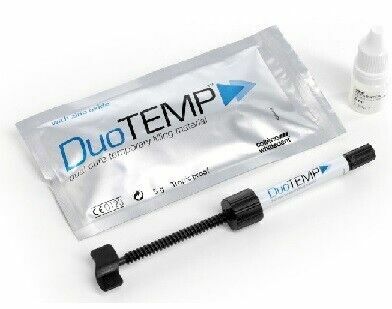 DuoTEMP is a dual-cured temporary filling material. It is a white-colored material that is eugenol-free, radiopaque and is formulated from zinc oxide and zinc sulphate for optimal protection from the infiltration of bacteria. DuoTEMP can be cured using both light and saliva. After only 40s of light curing the patient can immediately load the material.